Background and objectives Ambulatory BP is increasingly recognized as a better measure of the risk for adverse outcomes related to hypertension, an important comorbidity in patients with CKD. 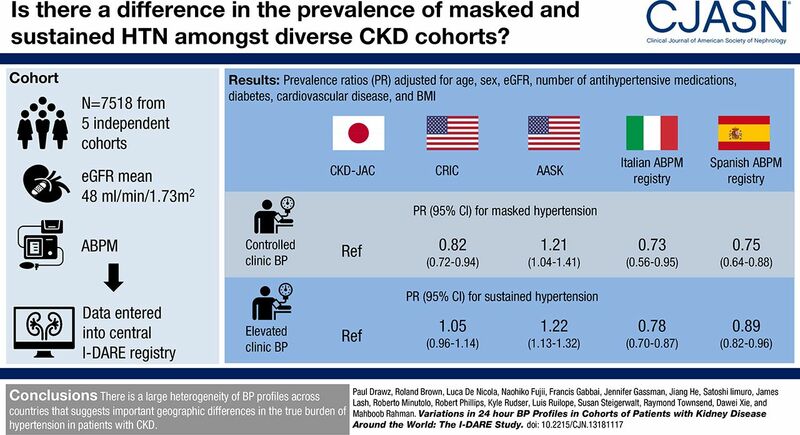 Varying definitions of white-coat and masked hypertension have made it difficult to evaluate differences in prevalence of these BP patterns across CKD cohorts. Design, setting, participants, & measurements The International Database of Ambulatory BP in Renal Patients collaborative group established a large database of demographic, clinical, and ambulatory BP data from patients with CKD from cohorts in Italy, Spain, the Chronic Renal Insufficiency Cohort (CRIC) and the African American Study of Kidney Disease and Hypertension Cohort Study (AASK) in the United States, and the CKD Japan Cohort (CKD-JAC). Participants (n=7518) with CKD were included in the present analyses. Cutoffs for defining controlled BP were 140/90 mm Hg for clinic and 130/80 mm Hg for 24-hour ambulatory BP. Results Among those with controlled clinic BP, compared with CKD-JAC, AASK participants were more likely to have masked hypertension (prevalence ratio [PR], 1.21; 95% confidence interval [95% CI], 1.04 to 1.41) whereas CRIC (PR, 0.82; 0.72 to 0.94), Italian (PR, 0.73; 0.56 to 0.95), and Spanish participants (PR, 0.75; 0.64 to 0.88) were less likely. Among those with elevated clinic BP, AASK participants were more likely to have sustained hypertension (PR, 1.22; 95% CI, 1.13 to 1.32) whereas Italian (PR, 0.78; 0.70 to 0.87) and Spanish participants (PR, 0.89; 0.82 to 0.96) were less likely, although CRIC participants had similar prevalence as CKD-JAC. Prevalence of masked and sustained hypertension was elevated in males, patients with diabetes, participants on four or more antihypertensives, and those with moderate-to-severe proteinuria. Conclusions In a large, multinational database, the prevalence of masked and sustained hypertension varied across cohorts independent of important comorbidities.